Note: Demonstrating with a real knife and sharpener makes this lesson much more impactful. Here is a great guide on proper sharpening technique. And of course, be careful not to get cut! Did you know the Bible talks about sharpening a knife? When I read the Bible, I am surprised by the diverse things it talks about. In the key verse, King Solomon uses sharpening a knife (or perhaps a dagger) as a comparison to friends who encourage each other in character refinement. Why does he use this comparison? Sharpening a knife is a task that requires skill. If it is not done precisely, the knife will actually become duller rather than sharper. To sharpen a knife a skilled craftsman needs a special instrument and time. The process today is not much different than it was in Solomon’s day. A craftsman uses a unique stone made of especially hard rock. Any rock will not do. It must have just the right amount of grit or roughness but not too much. It must be smooth on one surface. It must not be so brittle it breaks. The stone must be marginally rough to the touch. 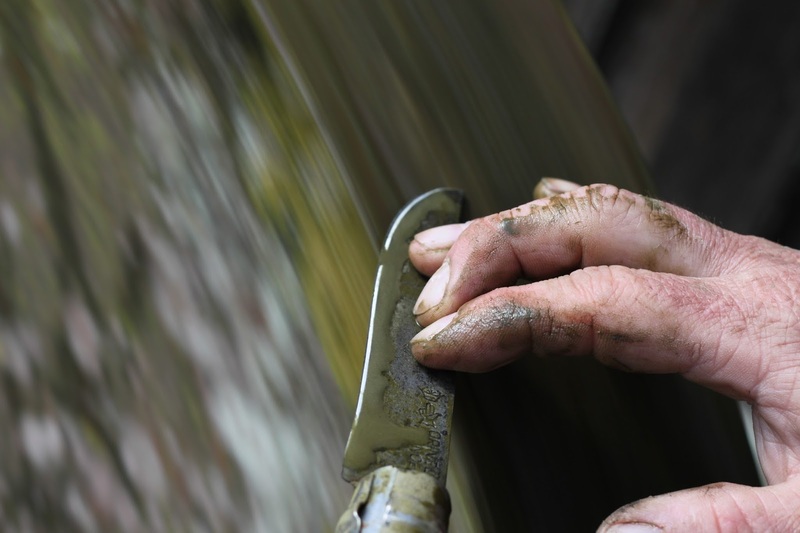 As the craftsman rubs it over the surface of the blade, it scrapes away very tiny pieces of metal. This has two functions, one is that it creates a sharp edge for cutting, the other is that it polishes the blade until it is smooth and shiny. A sharp edge is one that reflects light and easily slices through a sheet of paper. In ancient times a sharpening stone was often iron ore. Iron ore are a type of rocks containing iron that exist naturally in nature. These rocks were gathered and heated to extract the iron for the blade. After forging, another piece of iron ore was used to sharpen it. Thus Solomon’s phrase ‘iron sharpens iron.’ Iron ore is not the only type of stone available. Sandstone and even diamond work well. Many modern sharpeners use a layer of steel with diamond dust on the surface. So, what point Solomon is trying to make? He is both encouraging and warning us. He is encouraging us to hold our friends accountable to do the right thing. Sometimes this is hard, but that is what good friends do for each other. They help each other do the right thing, even when it’s difficult. Solomon is also warning us to stay away from negative friends, those who would dull our character by letting us or even pushing us to do the wrong thing. Do you have a friend who makes you a better person? How do they do that? How could you make your friends shaper and brighter? Have you ever tried to sharpen your own knife? How did it go? What can we do to stay sharp in our Christian walk?